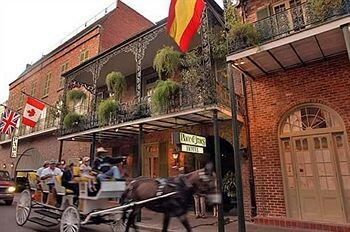 Property Location With a stay at Place d&apos;Armes Hotel, you&apos;ll be centrally located in New Orleans, steps from Presbytere and Louisiana State Museum. This romantic hotel is within close proximity of Saint Louis Cathedral and Cabildo.Rooms Make yourself at home in one of the 84 air-conditioned guestrooms. Cable programming provides entertainment, and wired and wireless Internet access is available for a surcharge. Bathrooms have complimentary toiletries and hair dryers. Conveniences include phones, as well as safes and desks.Rec, Spa, Premium Amenities Take advantage of recreation opportunities such as an outdoor pool, or other amenities including wireless Internet access (surcharge) and concierge services. Additional amenities include babysitting/childcare and discounted use of a nearby fitness facility.Dining A complimentary continental breakfast is included.Business, Other Amenities Featured amenities include high-speed (wired) Internet access (surcharge), limo/town car service, and complimentary newspapers in the lobby. A roundtrip airport shuttle is provided for a surcharge (available on request).